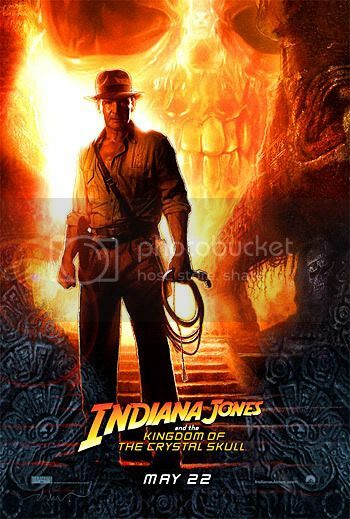 Having grown up with the previous three Indiana Jones movies, much as I did with the Stars Wars movies, it was with a little apprehension that I went to the theatre to catch this belated entry to the franchise. My main concern, as I 'm sure it is with many other fans, was whether Harrison Ford could pull off the role 20 years after last pulling on the old fedora and bullwhip. My secondary concern was whether it would be a Phantom Menace-style CGI extravaganza. The answer to my first concern, was yes, just about, there was only the odd occasion where I could tell it was a stunt double, but for the most part I was happy with his performance. As for the second concern? Of course there was a ton of CGI, most of which was fairly seamless but you could still tell it was there. On to the movie itself though. Set in 1957 at the heart of the "Better Dead Than Red" everyones-a-commie era Kingdom of the Crystal Skull has the Russians as the bad guys as, led by Cate Blanchett's Irina Spalko, they are searching for the legendary crystal skulls which they plan to use in the next level of weaponary by harnessing their powers of mind control. So begins a journey that starts in the mysterious Area 51 in New Mexico then proceeds all over South America, with Indiana Jones, and his new sidekick Mutt, being called back into action, even after the FBI question his integrity. Now, I'm not one for going into great details surrounding plots of movies, especially new flicks, and i'm not going to change now, as to reveal too much would be to spoil any enjoyment you might garner from it. What I will say though is that this has to be the most far-fetched and outlandish Indian Jones movie to date. Sure, there are the prerequisite chases, fight scenes, booby traps and creepy-crawlies but George Lucas, David Koepp et al have really gone overboard here. Did it spoil my enjoyment? Not really, but just get ready to leave you disbelief well and truly suspended for the duration of the movie. There are plenty of nods to the earlier movies here, with mention of his father (Henry Jones Sr), Marcus Brody (the late great Denholm Elliot) as well as the inclusion of Marion Ravenwood (Karen Allen). The humour that has come to be expected of these movies is also prevalent throughout, indeed I did laugh out loud on more than one occasion. However, there were other moments where I felt the humour felt a little flat, and forced even. The good moments did outweigh the bad though in my opinion, a scene involving a large snake being especially amusing. The action scenes were generally well choreographed, with the special effects being pretty damned good, I would however have liked to have seen a little more in the danger stakes. By this I mean that I never really feared for Indiana's safety, regardless of his predicament, he seemed to coast from one situation to another. Overall I would say that this is nowhere near as good as Raiders of the Lost Ark, but as a rip-roaring style of adventure flick it did enough to keep me happily amused for its 2 hour running time. Sure, it could have been better, by grounding it a little more in reality, but then these movies have always been about pure boys-own escapism, and that is pretty much what you get here. Just don't expect too much, Spielberg hasn't quite managed to bring back the glory days of the 1980's, he also didn't fail to bring a decent flick to the screen. Nowhere near perfect but I will be buying the DVD in the future. A 2.5 seems about right or a 2. It did not feel like an Indiana Jones film at many junctures even. The picture quality on the pirate DVD that i saw this on (before it was even released in American cinemas mind you) was pretty dodgy, the geezer who was filming it from the audience with the camera on a mobile phone (at a sceening in a chinese picture house) kept losing the edges of the picture which was a bit frustrating but i still thought it was magnificent entertainment and easily the best of all the Indiana Jones movies (stop being sentimental and nostalgic for that imagined world that never really existed in the first place anyway except in your own mind) this is a 4 out of 4 movie if ever there was one, that gorgeous little chinese bird who gets me these films she is such a little darlin` and the bird has got a great little mouth as well her blow-jobs are incredible.